In this case, you can start with taking a screenshot which contains the information the information that should be read. We can take a look at that then. Regarding tools: paint.net is good because it makes anotating screenshots with distinct image layers easy. I assumed people know the ADM Industry Index and where to find it. Best would be to give the script a list with System names (if done via ingame Notepad it is a link that can be clicked) after navigating to the correct window it will look like this. The important part is that the mouse now needs to hover over the rightmost partially filled in rectangle. Then this pops up. This is the important information we are after and want to record over time. I assumed people know the ADM Industry Index and where to find it. For sure there are people around who know more about the the ADM Industry Index than I do. after navigating to the correct window it will look like this. This looks like the region to move the mouse to is always at a fixed location relative to the lower right corner of a window. In this case you can use the title of the window (seems to be cropped away in the image you posted) to select the correct window. 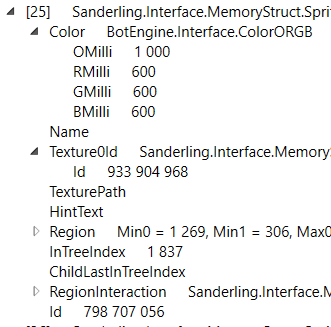 I think there is a good chance that this popup window is already contained in the memory measurement which is read by the Sanderling memory reading. We can look for it in the API explorer. One important point regarding tools: To share screenshots and other images, imgur.com works well. Sry I did not mean to offend in any way. Thank you for the good responses. The Problem might still be, that the important rectangle is not always in the same place. Sometimes it will be the first, sometimes the second,third… Also I never tried working with sanderlings. Can someone point me to a good point/guide to start? How can we find out where it is? How can you do that based on a screenshot? In your screenshot, I see that a text Industry Index appears on the row you marked. Can we use that label as a reference for the vertical location of the region to move the mouse to? Also I never tried working with sanderlings. Can someone point me to a good point/guide to start? If you have a question which is not covered there, I can look up the right guide for your question. maybe it is best to record the readout of every rectangle and stop whenever a “%” is shown. E.g. If a System has Level 3 30% it will read “Level 1” on the first “Level 2” on the second “Level 3 30%” on the third and “Level 4” on the fourth. Sure, we can go that route. I am setting up a Windows Instance for the EVE Online client here to test this. record the readout of every rectangle and stop whenever a “%” is shown. E.g. If a System has Level 3 30% it will read “Level 1” on the first “Level 2” on the second “Level 3 30%” on the third and “Level 4” on the fourth. //	After moving the mouse, give EVE Online client some time to open the tooltip. As you will see in the log, this script also outputs the text in the tooltip. Sorry I was away the last weeks. I will habe a look at this first thing tomorrow. Ty for your help.